The RhinoPolyhedra plug-in for Rhino 5 for Windows lets you create and visualize a variety of polyhedral shapes—over 400 different shapes. The Polyhedron command dialog now includes a preview image, plus it also displays the number of vertices and faces of the selected polyhedron. 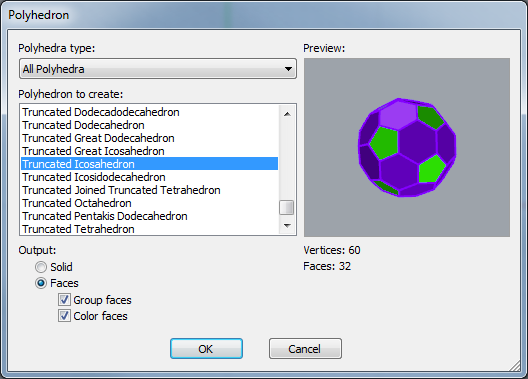 Many new geodesic and dual geodesic icosahedron solid shapes have also been added. Are you planing a Grasshopper component for Polyhedra?